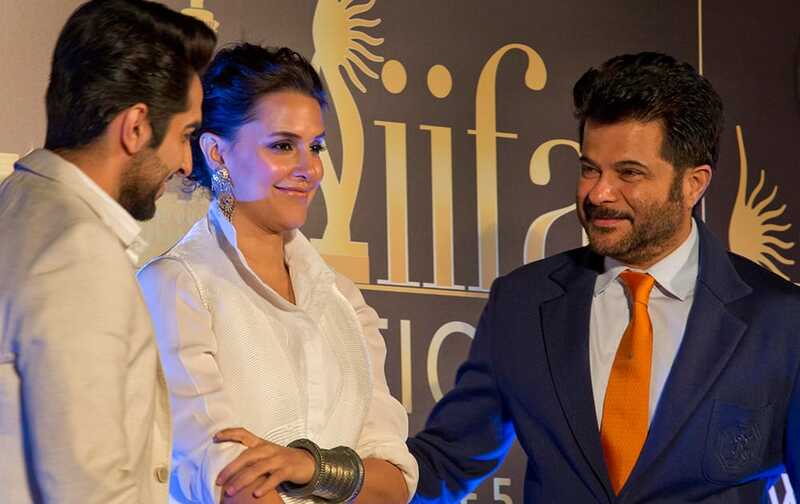 Ayushmann Khurrana, Neha Dhupia and Anil Kapoor attend a press conference held to announce the International Indian Film Academy award ceremony to be held in Kuala Lumpur in June, in New Delhi. US model Yasmine Petty arrives for the largest annual AIDS charity gala in Europe known as the Life Ball, at the Vienna International Airport near Schwechat, Austria. Television personalities Kris Jenner, Khloe Kardashian and Kylie Jenner attend the NBCUniversal Cable Entertainment 2015 Upfront at The Javits Center. Television personality Padma Lakshmi attends the NBCUniversal Cable Entertainment 2015 Upfront at The Jacob Javits Center in New York. Bollywood actors Kangna Ranaut and R Madhavan at a promotional event of their upcoming film Tanu Weds Manu Returns in Gurgaon. U.S personality Paris Hilton poses for photographers upon arrival for the Fragrance Foundation Awards at a central London venue. Kerry Washington attends The Paley Center For Media's panel discussion with the cast of 'Scandal', in New York. Katie Cassidy attends The CW Network 2015 Programming Upfront Presentation at The London Hotel.